Indiana University Press, 9780253017697, 328pp. 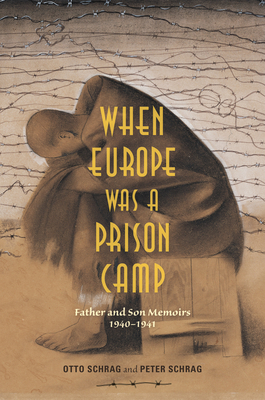 In a compelling approach to storytelling, When Europe Was a Prison Camp weaves together two accounts of a family's eventual escape from Occupied Europe. One, a memoir written by the father in 1941; the other, begun by the son in the 1980s, fills in the story of himself and his mother, supplemented by historical research. The result is both personal and provocative, involving as it does issues of history and memory, fiction and "truth," courage and resignation. This is not a "Holocaust memoir." The Schrags were Jews, and Otto was interned, under execrable conditions, in southern France. But Otto, with the help of a heroic wife, escaped the camp before the start of massive transfers of prisoners "to the East," and Peter and his mother escaped from Belgium before the Jews were rounded up and sent to Auschwitz. Yet, the danger and suffering, the comradeship and betrayal, the na ve hopes and cynical despair of those in prison and those in peril are everywhere in evidence. Peter Schrag is a lifelong journalist and author of Paradise Lost: California's Experience, America's Future (a New York Times Notable Book), and Not Fit for Our Society: Immigration and Nativism in America, among other books. A former executive editor of Saturday Review and editorial page editor of the Sacramento Bee, he has written for The Atlantic, Harper's, the Nation, New Republic, the New York Times, and other major publications.Otto Schrag (1902-1971) was born into a middle-class Jewish family in Germany. Among the last Jews to get a PhD from Heidelberg before the war, he entered his grandfather's beer malt-processing business. In 1935, he fled Germany, eventually settling with his family in Brussels. With the start of the German invasion, the Belgians arrested him as an enemy alien, thus beginning the events narrated here. In New York in the 1940s, he wrote three well-regarded novels. He returned to Germany in 1950 and successfully rebuilt the business the Nazis had seized. There he wrote another novel and translated From Here to Eternity into German.